From sharp lines to photo-quality images—HP 90 printing supplies get the job done right. To ensure consistent print quality, HP Smart technology in HP printheads, ink cartridges and the printer makes automatic adjustments to optimize print quality and reliability and monitors printhead life. You save time and increase your productivity, making HP supplies an excellent value. (Using genuine HP supplies ensures availability of all HP printing features). C5056A From sharp lines to photo-quality images—HP 90 printing supplies get the job done right. To ensure consistent print quality, HP Smart technology in HP printheads, ink cartridges and the printer makes automatic adjustments to optimize print quality and reliability and monitors printhead life. You save time and increase your productivity, making HP supplies an excellent value. 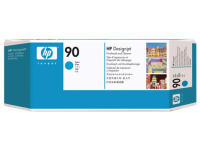 (Using genuine HP supplies ensures availability of all HP printing features). Smart choice. HP 90 Printheads and Printhead Cleaners produce consistent results. Innovative HP Smart printing technology continuously optimizes print quality. Managing supplies is easy with HP Smart printing technology. Expect predictable results with HP supplies designed together with the printer. 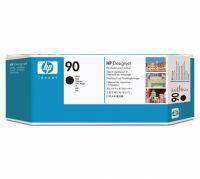 Long-life HP 90 Printheads mean fewer interruptions for changing printheads. Economical individual printheads—replace only the one that's needed. To Recieve updates and possible rewards for Hewlett Packard (HP) HP 90 Magenta Printhead and Printhead Cleaner please sign in. To Recieve updates and possible rewards for Printer Cartridge, Ink & Toner please sign in.